Mark Polson has been driving the highways of Alabama for four decades. During those years, Mark has built lasting connections and relationships with criminal courts across Alabama. When his son, Alabama DUI Lawyer Whitney Polson, graduated from law school and joined the Polson Law Firm, he started covering the same DUI court locations. Together, they have been able to bring a full measure of justice to thousands of citizens facing criminal prosecution, and the large majority of cases have been for drunk driving or drugged driving. This page shows the many courts where Alabama DUI cases have been handled by one or both of the Polsons. To obtain a FREE lawyer consultation, speak to one of our Birmingham DUI attorney partners. If you are too injured to travel, we can come to your location. 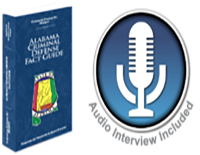 We Fight Alabama DUI cases across all of Alabama. Call us now at our office. 205-871-8838, or toll free at 1-844-776-5766 [1-844-7POLSON].